Climbing shoe technology has come a long way from that found in the first converse-style high-top rendition. 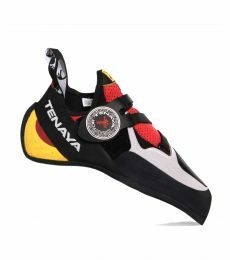 Tenaya are a Spanish brand who specialise in biomechanics and produce highly responsive performance shoes that are unparalleled in terms of comfort. Alex Megos' shoes of choice, nonetheless. 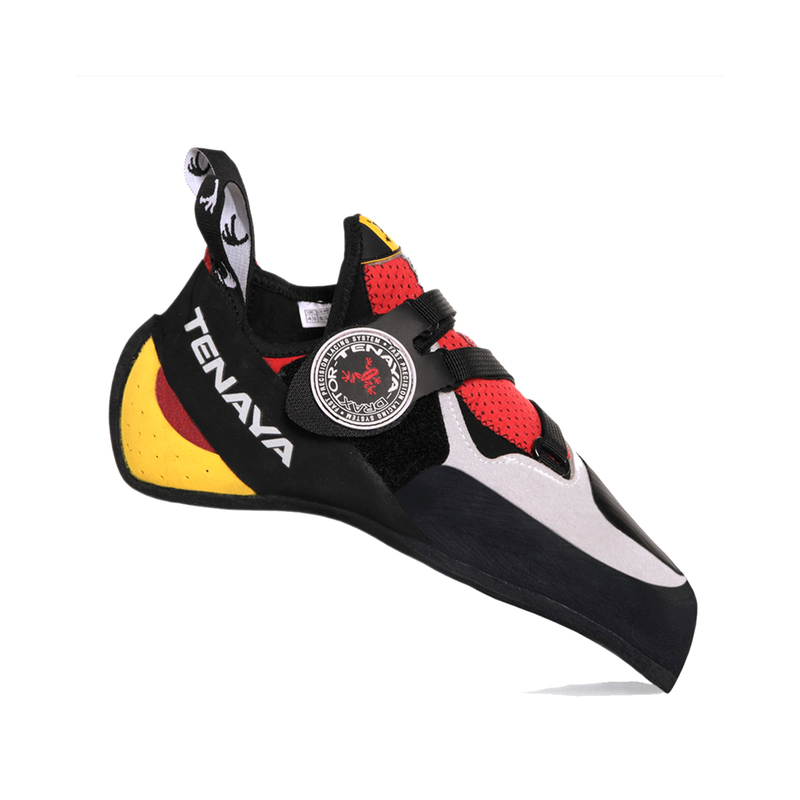 The Iati is the performance all-rounder of Tenaya's range, built with precision, strength, and balance for everything from sport climbing on tiny edges, bouldering on low friction rock, to endurance pitches on multi-pitch routes. Tenaya's moving-tightening SXRDynamics and dynamic-response RB RangeX technologies work with the foot's biomechanics, producing a climbing shoe that uses every resource available in your foot. The signature Draxtor Lacing system is infinitely adjustable and is one of the fastest, most efficient, and precise closure systems available. As for fit, the Iati features a microfibre / leather upper for the best balance of comfort and long-term performance. We recommend sizing a half size to a full size down from your regular climbing shoe size to find the best fit for you. Bear in mind there will be some stretch in the Iati. For the climber who seeks all-round performance on the basis of "high-performance without the pain", the Iati is built on strength, precision, and stability without the painful discomfort, for climbers of all disciplines. Great smearing, bomber heel hooking, sensitive and aggressive. These are by far the most comfortable shoes I ever wore as performance shoes, they feel like a thick sock, not at all like a climbing shoe. A bit stiffer than the Oasi, therefore better for face climbing. Mine did not have any manufacturing problems like the other reviews. My feet are not particularly wide or narrow, and are a bit incurved. I wear street size 45 and got 42. Could have gone 42.5 for a more comfortable fit, but I never ever wanted to take them off at the chains. Just bought my second pair of these shoes. They fit my wide feet perfectly. They are a bit hard to get on my feet the first couple of weeks but a bit of plastic (like from a plastic bag) behind the heel makes it easier. The only bad thing is that the small rubber flap on the top part of the heel seems to break pretty easy but that's mostly cosmetics. Good performance, not great build quality. I can't fault these shoes in terms of their performance. They're pretty versatile, and they are a great fit for someone like me with narrow feet. However, I have noticed much of the tongue stitching on both shoes has almost completely disintegrated. Also, the shoes have a very unpleasant chemical smell, despite minimal use and repeated cleaning. The red leather parts of the shoes absolutely hemorrhage red dye, especially when wet, and have stained other clothes and areas of my house. I buy the shoe from epic TV very fast delivery een de best schoe I ever had nice form perfect point! These are my top end shoes. I've got a pair of Tenaya Ra's for warm-up/easier routes etc, but when it comes to my top end I wear the Iati's. I bought them a wee bit small, but now they're finally broken in/stretched a bit they are perfect. Grip is excellent, to the extent that I'm dubious if I'd buy anything with Vibram XS Grip 2. And now comfort is great. I've got a second toe longer than my big toe, but the Iati's are still fine - not so asymmetric as to kill my feet. The Velcro lacing system works well and is adjustable (and can be switched to twin points rather than a single). And the lycra-type sock tongue is so much better than a conventional split or padded tongue. I'd definitely recommend them!